Is there any piece of clothing more ubiquitous than the tee shirt? They are everywhere. I've accumulated quite a few and, as I go through the house tidying up, I turn to the tee shirts. I did one clean back in June. Hauled them all out and culled ones I really didn't want. Some have gone into a box in the sewing closet. I like them, but not enough to wear. There is a pattern out in the universe for turning tee shirts into a blanket. It's on the list of things I'd like to do. After the initial cleaning, I put all the shirts back. I grab the first shirt on the left and decide if it's what I want to wear. Today's shirt is about Dungeons and Dragons and druids. I've become critical of what I have in the closet and have found myself actually giving away shirts I won't wear and aren't interested in saving. As with all my purging experiences, it feels good to give away things I no longer need or want. Several weeks ago, this shirt became next in line to be worn. The shirt is in excellent condition, considering it's 14 years old. 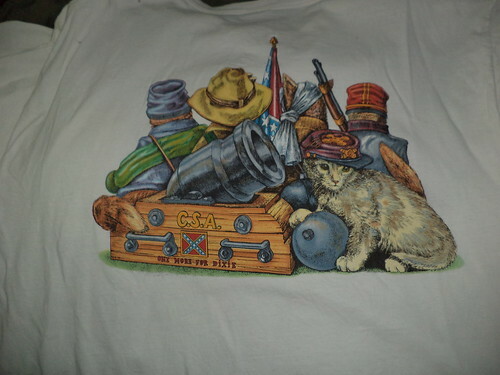 There was a time when I was buying shirts with this cat design on them. I've got one from a visit to Cape Canaveral and from a visit to St. Louis. 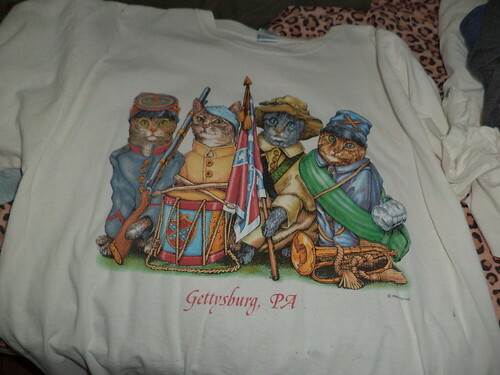 I got this when Carole and I visited Gettysburg. I bought this because it was cats. Fourteen years on, and, with the raw emotion of a shooting in South Carolina brought on by a white supremacist, the design is not benign anymore. I've learned so much more about the Civil War in the weeks since the shooting. I knew the "stars and bars" was the battle flag of Northern Virginia, but I assumed, incorrectly, it had been adopted by the entire confederacy. It was not. There was a separate flag for the entire confederacy. I assumed the flag stayed popular with the south after the war. It did not. After the surrender at Appomattox, Robert E. Lee called for the flag to be furled and never flown again. The flag was not widely adopted by southern interests, namely the KKK, until after World War II, when blacks started pushing for civil rights. I heard so many "It's the flag of our heritage" comments. I started looking further into this "heritage". Now, you need to understand, I have, to the best of family research, no one in this war. I'm sure they had opinions, but we do not know what they were. No immediate or even extended family member served in the war. But I grew up in a northern state. Even trying to be as neutral as possible about causes for the war, history is framed, even incidentally, by where you live. "It's about states rights." A common refrain. I leaned in that direction. A battle over the states determining their rights versus the federal government. Except no, no it wasn't. Don't believe me. Go to the source documents. Read "The Declaration of Causes of Seceding States" found at the web site, The Civil War Trust. Read all of the declarations. Georgia, Mississippi, South Carolina and Texas make it clear, they are seceding because of the potential that slavery will be abolished. From the Georgia document, "While the subordination and the political and social inequality of the African race was fully conceded by all, it was plainly apparent that slavery would soon disappear from what are now the non-slave-holding States of the original thirteen." From the Mississippi document, "Our position is thoroughly identified with the institution of slavery-- the greatest material interest of the world. Its labor supplies the product which constitutes by far the largest and most important portions of commerce of the earth. These products are peculiar to the climate verging on the tropical regions, and by an imperious law of nature, none but the black race can bear exposure to the tropical sun. " From the South Carolina document, "We affirm that these ends for which this Government was instituted have been defeated, and the Government itself has been made destructive of them by the action of the non-slaveholding States. Those States have assume the right of deciding upon the propriety of our domestic institutions; and have denied the rights of property established in fifteen of the States and recognized by the Constitution; ..."
From the Texas document, "In all the non-slave-holding States, in violation of that good faith and comity which should exist between entirely distinct nations, the people have formed themselves into a great sectional party, now strong enough in numbers to control the affairs of each of those States, based upon an unnatural feeling of hostility to these Southern States and their beneficent and patriarchal system of African slavery, proclaiming the debasing doctrine of equality of all men, irrespective of race or color-- a doctrine at war with nature, in opposition to the experience of mankind, and in violation of the plainest revelations of Divine Law. " I looked at the tee shirt and, given the new information I had, could not wear it, could not keep it. It lifts up "the lost cause" idea; that the war was, somehow, an honorable struggle against an oppressive Federal government overstepping its bounds. "The Lost Cause" was provided as a way for southerners, not all mind you, to not see dishonor in defeat. They struggled for their way of life and were nobly beaten. "The Lost Cause" also portrayed slave owners as beneficent. Under this idea, a slave had a better life than if they had to work the land themselves never mind they were considered property, like a mule or a bucket. It's a wrong idea, but it's there. We can't erase this from history. It happened. Other onerous events in human history happened as well and they must not be forgotten while we excise the symbols of man's inhumanity to man from public view. The flag belongs in a museum. It needs to be preserved while scholars ruminate over the facts and legacy of its use. I gave away the shirt. I can't look at the flag now and see a symbol of anything other than the express desire to discriminate and subjugate.